Overview - What is Windows Update Error Code 646? Windows Update Error code 646 is an error that is generated by Windows Installer, and is usually seen when trying to install updates to Microsoft Office. If Windows Installer discovers a problem while updating Microsoft Office, you may see this error. It's an indication that an error has been found, and that the requested updates or automatic updates have failed. You should therefore attempt to solve the problem before any future updates can be attempted. Failure to remedy the problem will mean new updates are unlikely to be downloaded and installed. While the last example here does not specifically mention error code 646, it is a related error message regarding the update of Microsoft Office, as you will see from the solutions below. You will receive this general error code when Windows Installer discovers an error. 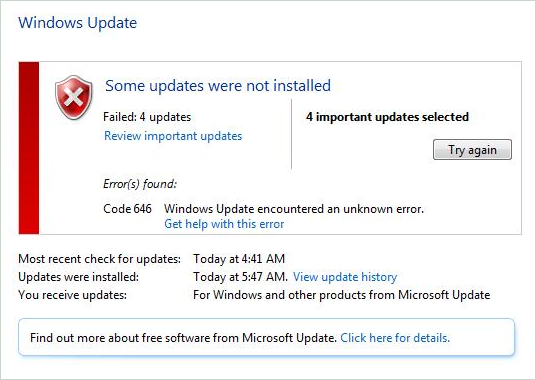 Error Code 646 specifically relates to downloading Windows Update files and installing them through Windows Installer. This usually occurs when updating Microsoft Office, and when using a firewall, but it can be seen on other occasions too, particularly when using Windows Update. You will generally see a Windows Update Error code 646 if there is an incorrect value in the registry. If you're using a firewall, either Windows built in firewall or a third party firewall, sometimes this blocks Windows Update from downloading and installing updates onto your computer. To solve the issue, you can turn off your firewall while the updates are being downloaded and installed. Once completed, you can turn your firewall on again. This is not an ideal solution due to the dangers of turning off a firewall and thus potentially exposing the system risk. Alternatively, it's possible there is an invalid entry located in your registry, which is causing this error to appear when Windows Update is evoked. To repair the problem, conduct a Windows system repair or manually make the registry fix described below. There is also a repair tool you can download directly from Microsoft that will automatically repair the correct registry keys for you. This is available from the Microsoft support website. If the value is anything else, replace it with the correct data, then try the update again. Do not edit your registry if you do not feel comfortable doing so.